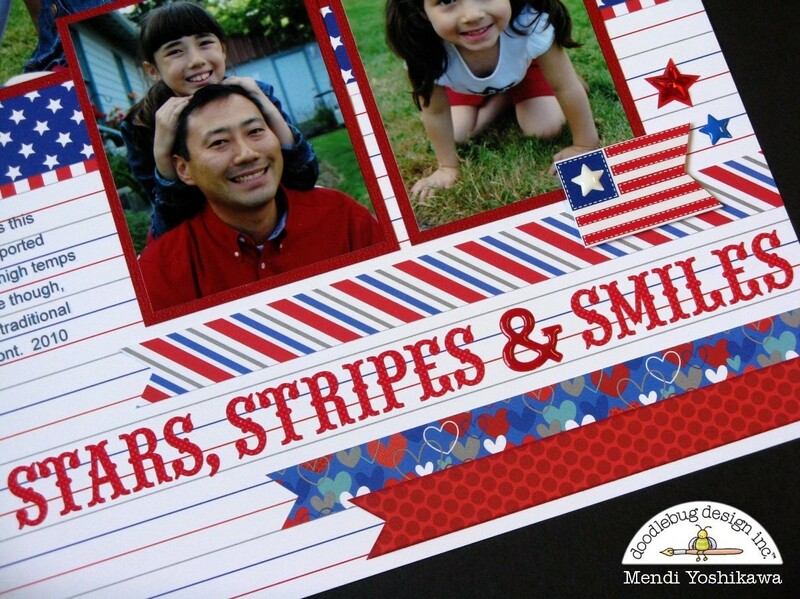 I'm up on Doodlebug's blog today and I can hardly contain my excitement! 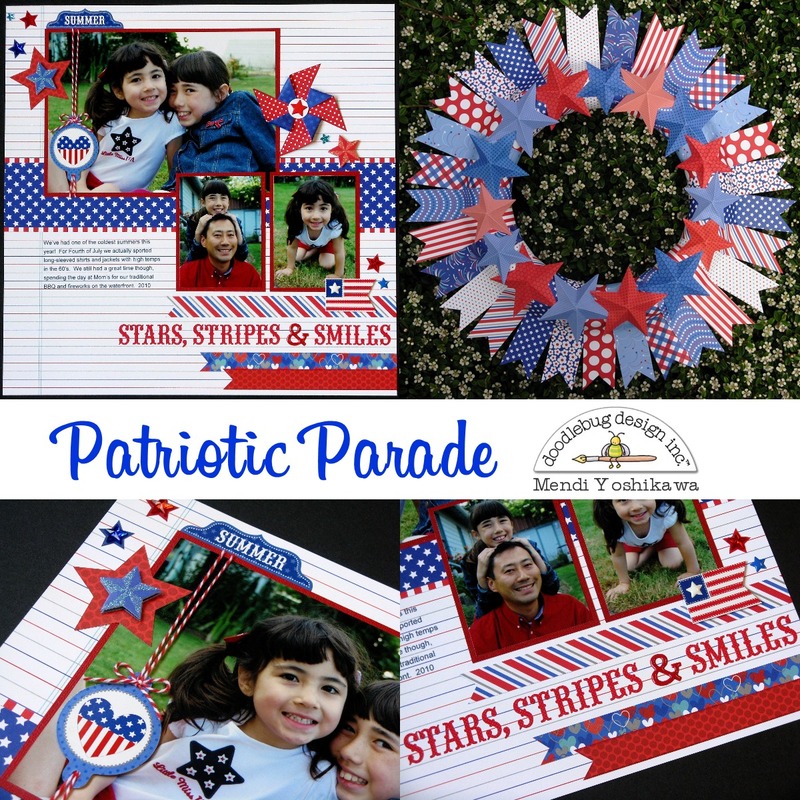 I am a sucker for red, white and blue and I couldn't wait to dig into Doodlebug's newest Patriotic Parade collection using it for both a layout and a wreath to decorate my home with for the fourth! To create my wreath, I combined a couple different popular wreath styles that I've seen floating around Pinterest lately (examples of which can be seen here and here). 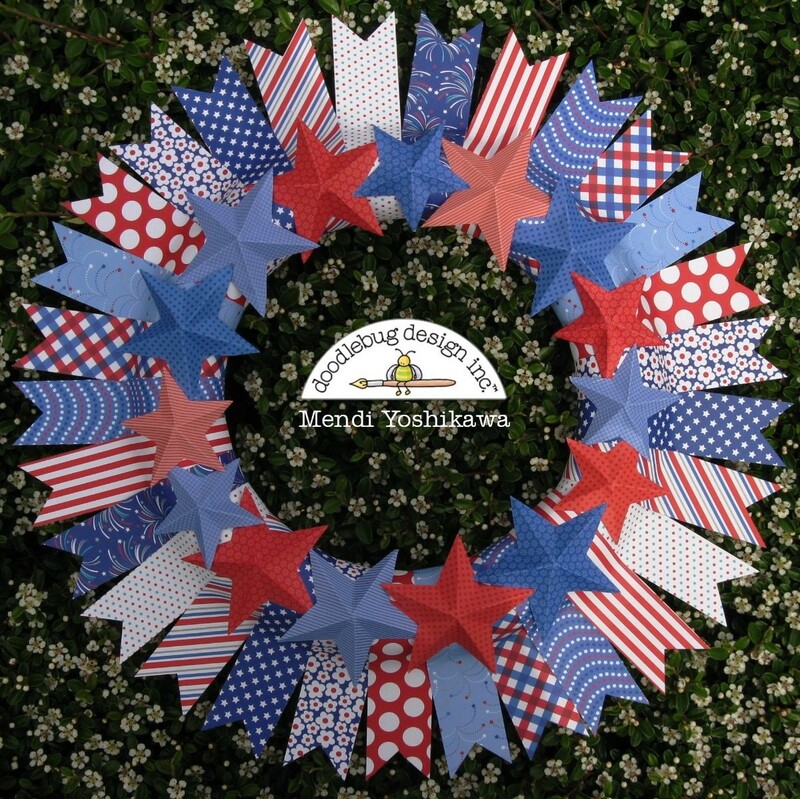 I started by covering a 9" foam wreath form with strips of paper that were cut 1.5" wide by 12" long and then used my ATG adhesive to wrap them around it, starting with the outer ends and then squeezing them tight around the wreath. Afterwards you can simply cut the ends into cute little V's (or in my case I created my strips on my Silhouette software with the V's already cut out from each end). 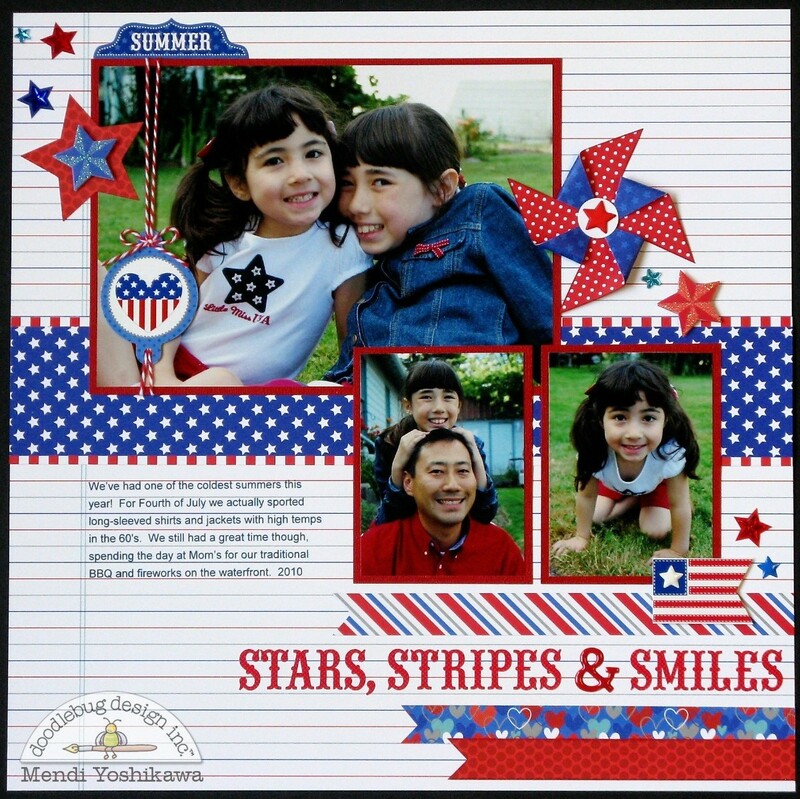 After I was done I cut out stars that were both 2.75" tall and 3.5" tall on my Silhouette and scored them towards the center, which allowed me to fold them and make them more dimensional. 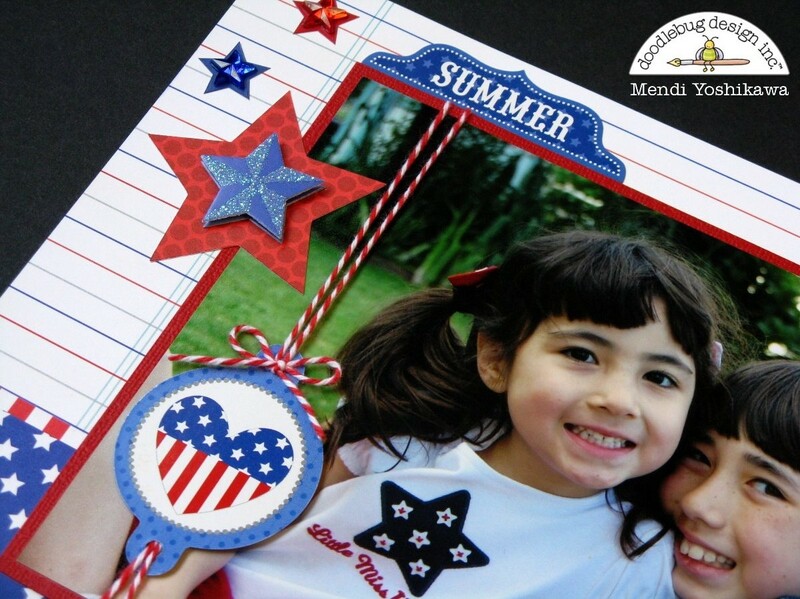 Wendy Sue shared a great tutorial on this a couple years ago (found here). With the explosion of patterns for my other paper strips, I tried to keep this layer more monochromatic using my favorite tone-on-tone Petite Prints. To adhere them I used a glue gun on the five inner spots were the star folding inward and held my fingers on the spots until it looked like the star was stuck tight. I was surprised at how quickly this came together and it is something I know my family will enjoy for many years to come! Love, love, love the wreath! It looks amazing! The layout is also so cute. I love the bakers twine and heart embellishment on the picture.